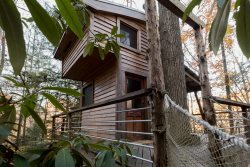 Enjoy relaxing in the heart of the Red River Gorge at Wildflower Cabin and step right out the door onto miles of trails with spectacular views. The cabin is accessible by road and is nestled in glades of spectacular wildflowers. The kitchen, living room, bedrooms, and bath are all on one floor. Wildflower cabin has one bedroom with 4 bunk beds and one futon that can sleep 2. The maximun occupancy is 6 adults. Wildflower cabin is located alongside Route 77 (Nada Tunnel Rd.) in the Red River Gorge geological area, and is perfect for a family, or one or two couples. Enjoy relaxing in the heart of the Red River Gorge Geological area and step right out the door onto miles of trails with spectacular views. Wildflower cabin has immediate access to Trail #221, the Rough Trail, from the Martin’s Fork parking lot. Kitchen: Furnished with a gas stove, double sink, compact fridge, microwave and coffee pot. Cookware, dishware, dish soap and cleaning linens will be provided as well. Living/Dining: The main room has a kitchen table for 4 as well as a futon couch. Bedroom: Two twin bunk beds with pillows and a full futon in the main room. Additional Amenities: Small charcoal grill, wall heater, space heater, air conditioning, box fan, TV (DVD only), and private fire pit.